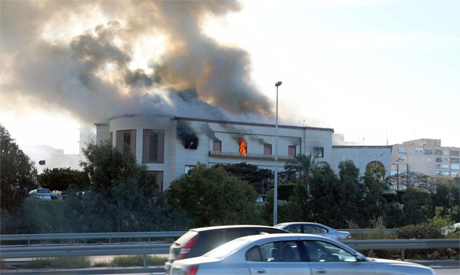 At least three people were killed when suicide bombers attacked Libya's foreign ministry in Tripoli on Tuesday, the health ministry said. The assailants were suspected to be Islamic State militants, a security source said. The three attackers began their assault with a car bomb, damaging vehicles and buildings, and then opened fire on the ministry. Two managed to get inside and blow themselves up. The other was killed by ministry guards, the source said. Heavy smoke rose from the building which was surrounded by security forces as people were rushed to hospital. The health ministry said at least eleven people were wounded. The ministry denounced the attack on its employees, saying: "the Libyan people are waging a war on terrorism on behalf of the world." Suicide bombers have targeted a number of Libya's vital institutions as militant groups take advantage of the chaotic political situation. A source from Tripoli Revolutionaries Brigade, one of the strongest armed groups in the capital, told Reuters their spokesman, Abdulrahman Mazoughi, died in the attack.